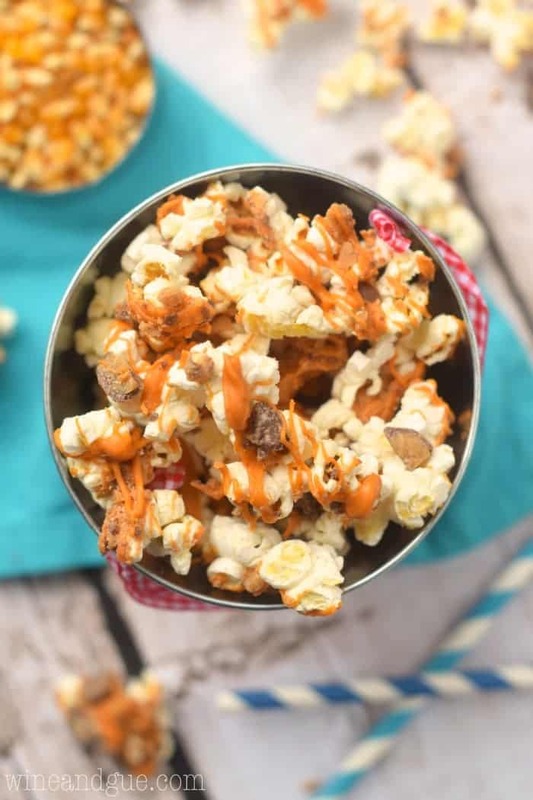 This Butterscotch Toffee Popcorn is THREE ingredients and only takes about five minutes to make! Remember the other day when I mentioned that the toddler had the stomach flu . . .
Well . . . keep that going, multiply it by one kid, add in a five week ear infection that won’t quit in a baby that is teething, throw in some spring break and what do you get? The answer is that you get hell. So what do you do when you have a baby who won’t let you put her down, a toddler who says her tummy hurts SO BAD but you mistakenly call her bluff and make her eat her dinner anyway (#soverywrong), and a seven year old who wants to play video games all the live long day? Well . . . a normal person would push a strong pause button on the blog. Well . . . I mean . . . we know where this is going, right? I mean, I really had every intention of not doing blog posts this week, because well, see above. But I think I might be an addict. It’s like I couldn’t not post. So here we have just about the easiest recipe you could imagine. Three ingredients, it takes like 5 minutes to make, but it is so super delicious. 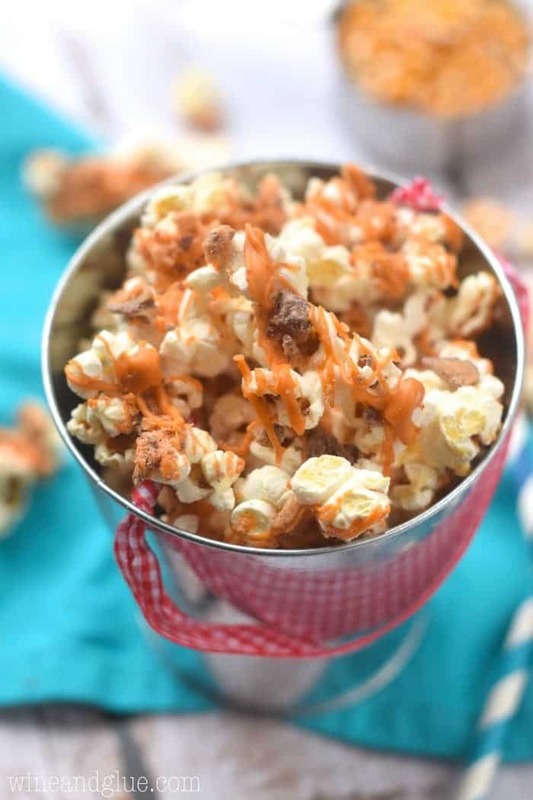 Butterscotch + Toffee Chips + Popcorn = Super Win! Now, if you need me, I will be sitting in a corner covering my ears and eating this popcorn. Spread the popcorn out over a wax paper lined baking sheet. Drizzle it with about half of the melted butterscotch. If the butterscotch is too thick to drizzle, add vegetable shortening until it is thin enough to drizzle. Add about half of the toffee chips, sprinkling them on top, then the remainder of the butterscotch, and the remainder of the toffee chips. For the popcorn, you can either use a popped bag of microwave popcorn, or you can take 1/3 cup of popcorn kernels, place them in a large microwaveable bowl, cover them with a drizzle of vegetable oil, cover the bowl with a microwaveable plate, and cook for three to four minutes or until the popcorn stops popping. Remove the unpopped kernels before making the recipe. I’m sorry your kids have been keeping you hostage, Lisa! I’m in your boat this week, home with all three on a supposed spring break. Spring break for whom, I might ask? Love this popcorn. Hide yourself in a closet and eat it away from the kids. Hang in there! I’ve totally done the make her eat dinner thing. AND the make her drive in a car to dance class thing. Yeah, that was NOT FUN. I’m sending you hugs and eating your popcorn. 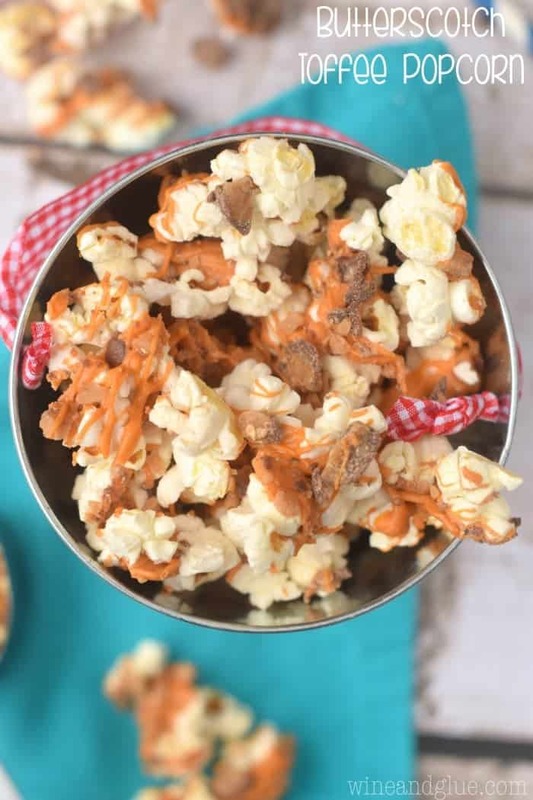 SO sorry about your week — I hope you made an extra batch of this popcorn to get you through! 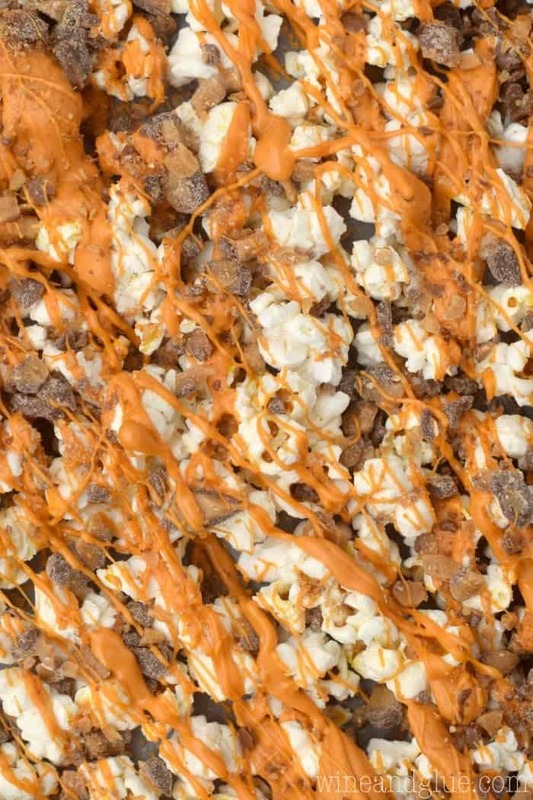 I have no self control when it comes to snacking on popcorn – let alone popcorn coated in a butterscotch toffee sauce. This is VERY dangerous (and delicious).